This is an implementation of a simple HTTP Proxying connection. 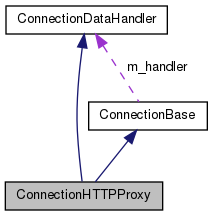 The reason why ConnectionHTTPProxy doesn't manage its own ConnectionTCP is that it allows it to be used with other transports (like IPv6 or chained SOCKS5/HTTP proxies). Definition at line 47 of file connectionhttpproxy.h. Constructs a new ConnectionHTTPProxy object. connection A transport connection. It should be configured to connect to the proxy host and port, not to the XMPP host. ConnectionHTTPProxy will own the transport connection and delete it in its destructor. port The port to connect to. This is the XMPP server's port, not the proxy's. The default of -1 means that SRV records will be used to find out about the actual host:port. Definition at line 32 of file connectionhttpproxy.cpp. Definition at line 44 of file connectionhttpproxy.cpp. Definition at line 57 of file connectionhttpproxy.cpp. Definition at line 119 of file connectionhttpproxy.cpp. Definition at line 77 of file connectionhttpproxy.cpp. Definition at line 88 of file connectionhttpproxy.cpp. Definition at line 127 of file connectionhttpproxy.cpp. Definition at line 173 of file connectionhttpproxy.cpp. Definition at line 215 of file connectionhttpproxy.cpp. Definition at line 138 of file connectionhttpproxy.cpp. Definition at line 63 of file connectionhttpproxy.cpp. Definition at line 103 of file connectionhttpproxy.cpp. Definition at line 95 of file connectionhttpproxy.cpp. Definition at line 111 of file connectionhttpproxy.cpp. Definition at line 69 of file connectionhttpproxy.cpp. Switches usage of HTTP/1.1 on or off. http11 Set this to true to connect through a HTTP/1.1-only proxy, or false to use HTTP/1.0. Defaults to HTTP/1.0 which should work with 99.9% of proxies. Definition at line 147 of file connectionhttpproxy.h. Definition at line 133 of file connectionhttpproxy.h. host The XMPP server hostname (IP address). port The XMPP server port. The default of -1 means that SRV records will be used to find out about the actual host:port. Definition at line 125 of file connectionhttpproxy.h.